This Easy Poppy Seed Roulettes Recipe is super easy to make, as minimal steps are required to achieve a super delicious roulette. 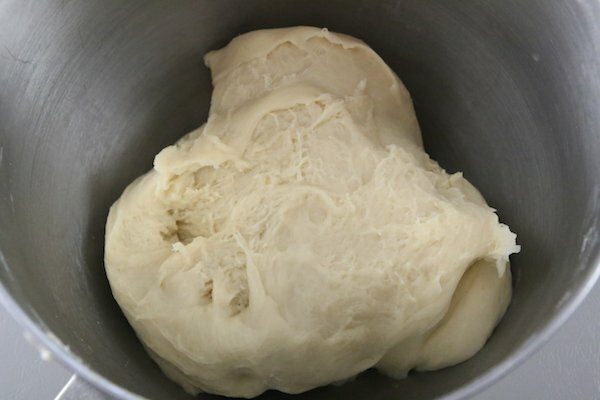 What I mean by minimal steps, is that after the yeast proofs you are ready to make the dough and let it rise. 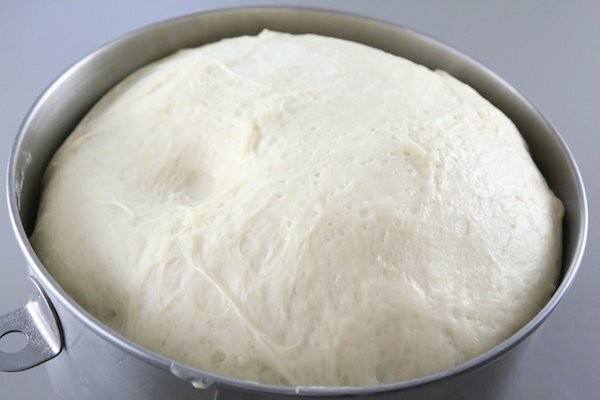 No need to allow the dough to sponge or go through a double rising stage. Easy simple method and incredibly yummy results! A huge thanks to my friend who shared this Easy Poppy Seed Roulettes Recipe with me. I love that the dough is super easy to handle (you don’t even need to dust flour when working, it’s so nice to work with) and the rolling part is pretty cool. 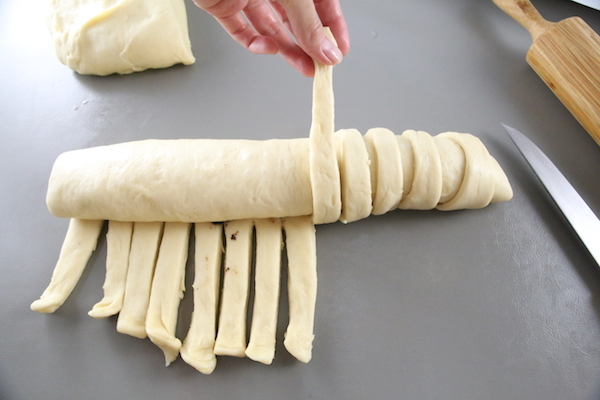 I don’t think you can go wrong with braiding the tops to these rolls (well I’m not so sure if you consider that braiding.) But I seriously think the way these are rolled really help from preventing any cracks on the roulettes. These are a must make if you like sweet pastry! 1. 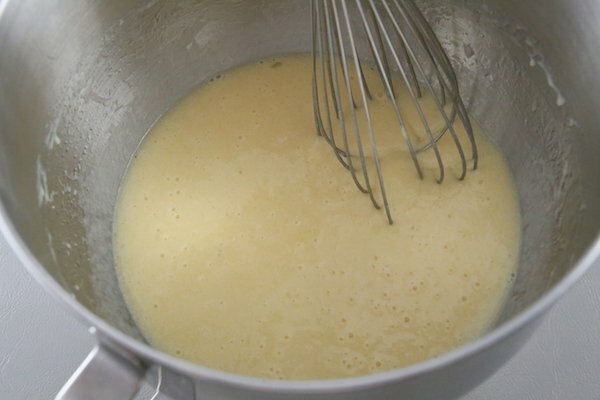 In the bowl of a stand mixer, whisk together the sugar and warm milk then add in the dry yeast; whisk and allow to proof for 30 minutes. 2. Meanwhile sift together the salt and flour. Set aside. 3. 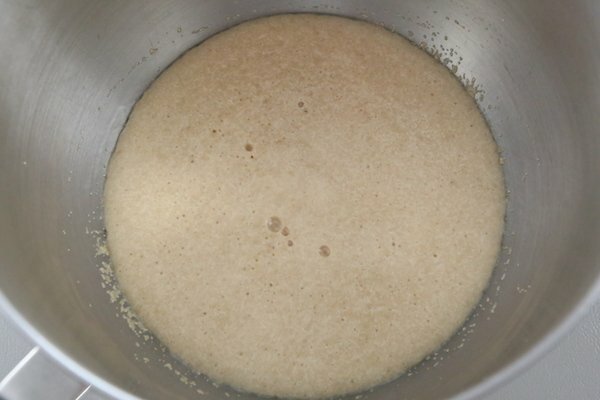 After the yeast has proofed (it should have formed a foamy skin) whisk in 2 eggs and melted butter. 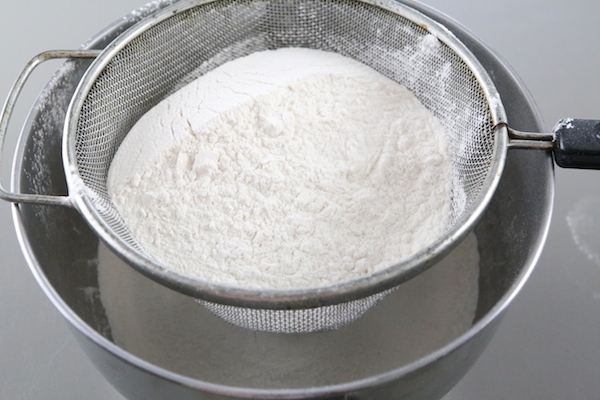 Using a spatula stir in 4 cups of flour and attach the bowl to the mixer. Knead for 10 minutes gradually adding the remaining 1/4 cup of flour during the kneading time. 5. 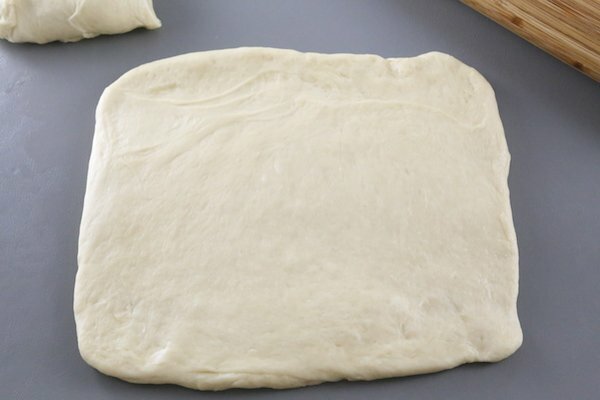 Divide the dough into 2 equal portions and roll each piece out into a 10″ by 11-inch square. 6. 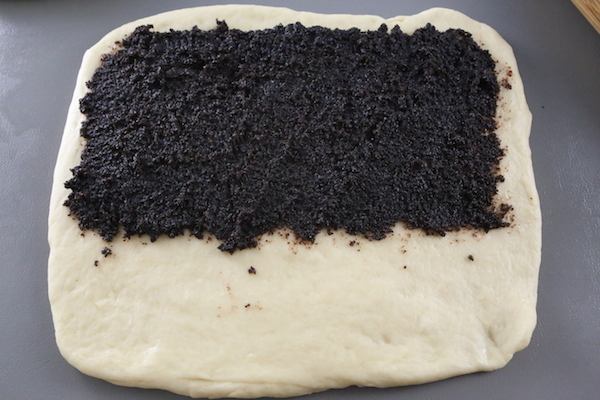 Spread 1/2 a cup of the poppy seed filling onto 2/3 of the square. 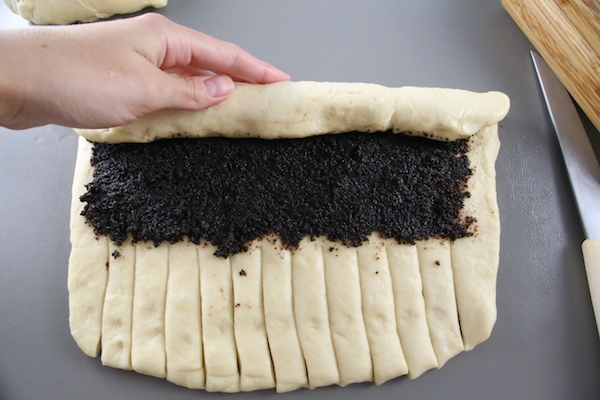 Then cut the bottom unfilled section into 1″ strips and begin to roll, starting from the poppyseed filling side. Stop when you get to the strips and wrap each strip over the roll, stretching out the strip if needed and pinching down the ends. 7. 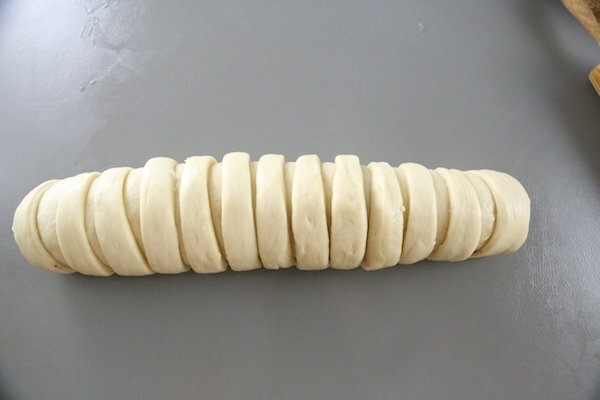 Place the rolls onto a lined baking sheet and allow to rise for 30 minutes. 8. 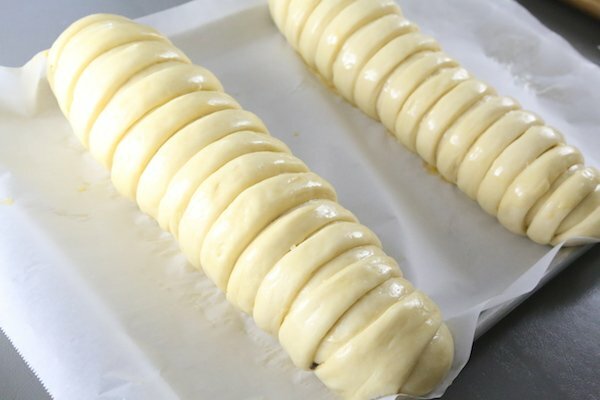 Pre-heat the oven to 350 degrees F. Brush rolls with a beaten egg and bake for 22-25 minutes. In the bowl of a stand mixer, whisk together the sugar and warm milk then add in the dry yeast; whisk and allow to proof for 30 minutes. Meanwhile sift together the salt and flour. Set aside. After the yeast has proofed (it should have formed a foamy skin) whisk in 2 eggs and melted butter. 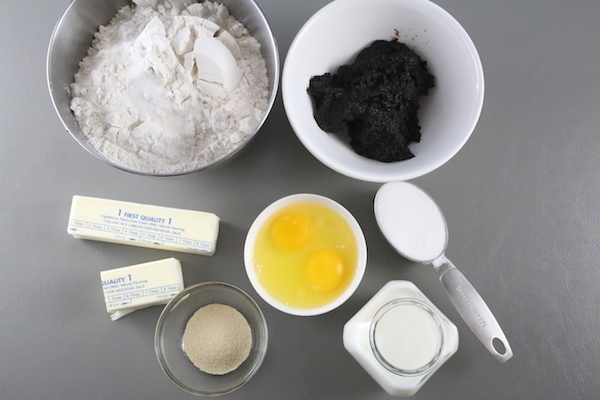 Using a spatula stir in 4 cups of flour and attach the bowl to the mixer. Knead for 10 minutes gradually adding the remaining 1/4 cup of flour during the kneading time. 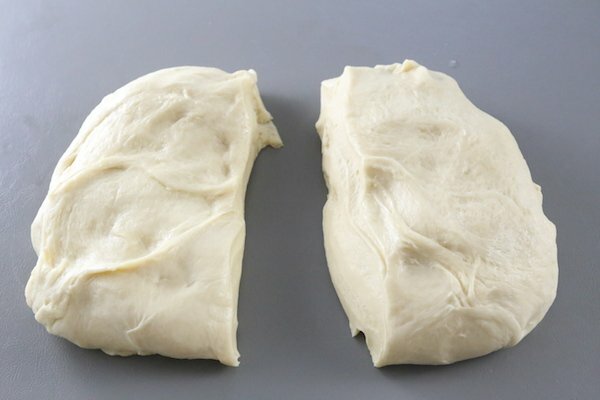 Divide the dough into 2 equal portions and roll each piece out into a 10" by 11-inch square. Spread 1/2 a cup of the poppy seed filling onto 2/3 of the square. 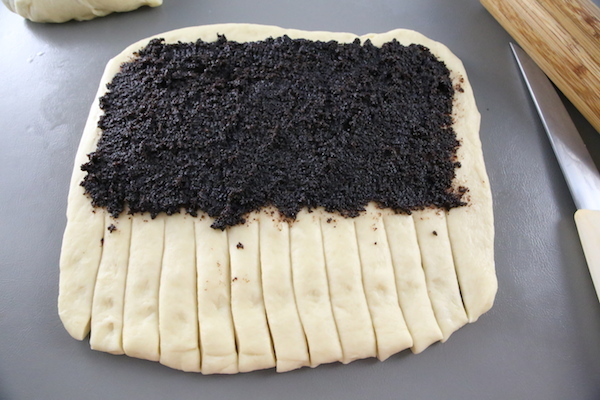 Then cut the bottom unfilled section into 1" strips and begin to roll, starting from the poppyseed filling side. Stop when you get to the strips and wrap each strip over the roll, stretching out the strip if needed and pinching down the ends. 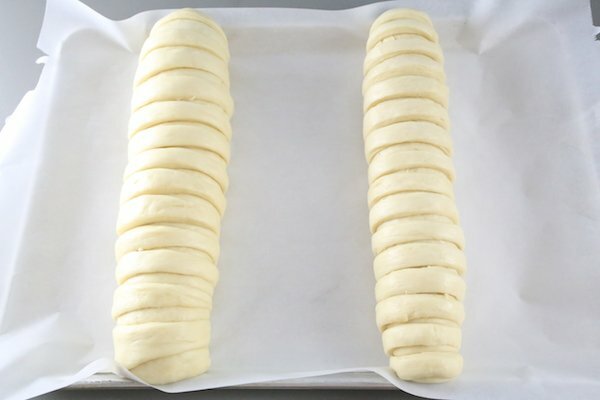 Place the rolls onto a lined baking sheet and allow to rise for 30 minutes. Pre-heat the oven to 350 degrees F. Brush rolls with a beaten egg and bake for 22-25 minutes. Is the butter salted or u salted? Hi Inna, my recipes usually call for unsalted butter unless I specify that it’s unsalted. This are my absolute the best Poppy seed roulettes! Whenever we make them at our house I just can’t stop eating them!Thank you. and I’m talking the can from allbulkfoods. This is a ready to use poppy seed filling, so no grinding is required. Hi Alyona where do u buy The poppy seed filling ? We usually get this very good canned poppy seed filling from my aunt who buys them for us all the way from Wisconsin. This poppy seed filling is so good and creamy (you can probably eat it from a spoon:) However you can buy it here: http://www.allbulkfoods.com/product_info.php/cPath/1001_41/products_id/195300. It comes in a big can but you can easily transfer the filling into a zip-loc bag (after it’s been opened) and freeze when needed. It doesn’t freeze into a block so you don’t have to worry about scooping it out.